Adjustable king size beds are a good option for people who want convenience and comfort in bed while doing various activities. They're also ideal for those who need to elevate part of their body while they sleep. An adjustable bed has a remote control that allows you to raise the head of the bed and the foot of the bed. You can raise the head and feet together or one at a time. Being able to raise the head of your bed allows you to do activities such as watch TV, work on a laptop computer, read, craft or eat much more comfortably. It also allows you to sleep elevated at many different levels. An adjustable bed also allows you to elevate your feet. Many people prefer to do this just because it's comfortable and others actually have medical conditions that require them to elevate their feet. If you want to lie flat again, there is a button on the remote that lowers both the head and the foot of the bed simultaneously. There are many more companies that sell adjustable beds, these are just a sample. Most of these beds have very similar features as far as raising and lowering the head and feet. The main differences are going to be in the types of mattress, the look of the base, special features and price. When you get into the larger sizes for adjustable beds, such as queen and king, you have the choice of having a single bed that adjusts the same on both sides or a split bed that is actually two separate beds. When placed side by side, the split beds measure the same width as a queen or king size bed. Some companies only offer king size beds as split beds. You can also find a California king size with certain companies, such as Atlantic Beds and Sleep Comfort. The split bed is really the best choice for an adjustable bed if you and your partner want to be able to control the elevation of your head and feet individually. Most beds also come with massage and heat features. With a split bed, each person can choose their favorite settings for massage and heat. One partner may like a vigorous massage setting while the other might prefer a lighter vibration. However, there are disadvantages with the split beds. The first thing to consider is bedding. You can't buy an all-in-one bedding ensemble with split beds, where the sheets, bed skirt, comforter and shams are all included. This is because you can't use regular queen or king sized fitted sheets on a split bed. You have to buy two sets of twin sheets. It's the same with the bed skirt. You can't put a queen or king sized bed skirt on two split beds because they raise and lower individually. You can use a queen or king sized comforter on the top of the bed. When the bed is made, split beds look like a single bed. Another consideration is how close you prefer to sleep with your partner. If you like to cuddle or "spoon" close together, the crack between the two beds can become an issue for whoever ends up sleeping on or in it. You should take everything into consideration before deciding which type of adjustable king size bed to buy. Perhaps the most important element when considering which bed to go with is the mattress. Most adjustable beds work in pretty much the same way, however the comfort and quality of the mattress can make a big difference. For instance, the Tempur-Pedic beds will have the patented memory foam-type mattresses. The company claims their specially engineered Tempur material is superior to regular memory foam. 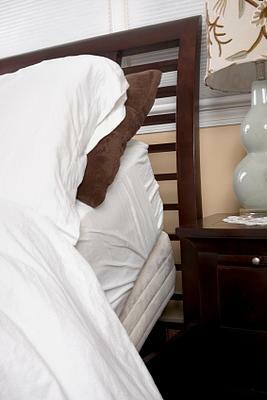 All adjustable beds have specially designed mattresses that are able to bend. The best thing to do if you can, is try to find some show rooms in your area where you can go try out the different mattresses. You can never really know how a bed feels until you lay on one. Sometimes, you need to sleep on one for a period of time to really know if it works for you. Look for a company that will let you try out their mattresses. Craftmatic gives you a 30-night in-home trial and Sleep Comfort will give you 90 days to switch to a different type of mattress if you're dissatisfied with your first choice.